Oscar-nominated actress and star of the new musical drama Rise, Rosie Perez’s never-before-told story of surviving a harrowing childhood and of how she found success—both in and out of the Hollywood limelight. Rosie Perez first caught our attention with her fierce dance in the title sequence of Do the Right Thing and has since defined herself as a funny and talented actress who broke boundaries for Latinas in the film industry. What most people would be surprised to learn is that the woman with the big, effervescent personality has a secret straight out of a Dickens novel. At the age of three, Rosie’s life was turned upside down when her mentally ill mother tore her away from the only family she knew and placed her in a Catholic children’s home in New York’s Westchester County. Thus began her crazily discombobulated childhood of being shuttled between “the Home,” where she and other kids suffered all manners of cruelty from nuns, and various relatives’ apartments in Brooklyn. Many in her circumstances would have been defined by these harrowing experiences, but with the intense determination that became her trademark, Rosie overcame the odds and made an incredible life for herself. She brings her journey vividly to life on each page of this memoir—from the vibrant streets of Brooklyn to her turbulent years in the Catholic home, and finally to film and TV sets and the LA and New York City hip-hop scenes of the 1980s and ‘90s. More than a page-turning read, Handbook for an Unpredictable Life is a story of survival. By turns heartbreaking and funny, it is ultimately the inspirational story of a woman who has found a hard-won place of strength and peace. 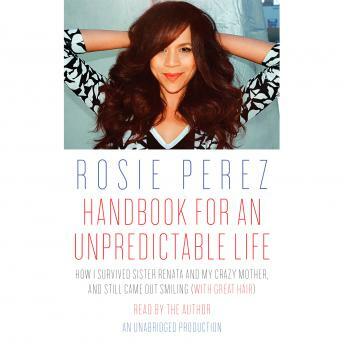 I loved Rosie's honesty,sincerity, and heartbreaking story. I think she is a great human being. To find the courage to tell her story is very much humbling. Thank you for sharing. Excellent rosie!! Fantastic audio book. Loved the stories! Loved this audio reading! Heart wrenching story yet delightful!